Your teeth have fissures, grooves, and pits that are hard to clean, which makes them prone to decay. This is because the foods you eat tend to stick in them over time and even the most hyped toothbrush may not be able to clean them out. To solve this problem, Downtown Dental provides the fissures or dental sealants to fill up these grooves and pits. Dental sealants are placed on the top of the back teeth grooves and front teeth pits to help create a smooth surface that is easier to clean. The sealants also prevent the sticking of foods on the teeth, which prevents the decay of teeth and development of other dental issues. Sealants are an excellent way to prevent cavities and dental caries that make it hard for you to maintain good dental care. We provide a way for you to maintain a healthy oral cavity with reduced formation and accumulation of plaque. However, having dental sealants does not mean the end of your dental care routine. You have to brush your teeth regularly and use floss for good dental health. Dental sealants are an excellent option for you to help limit dental decay that may cause an unpleasant odor and oral cavities. Dental decay is especially common with molars and premolars because they are the most susceptible to the deposition of plaque. As a preventive treatment for your dental work, pit and fissure sealants act as a barrier between your teeth and the bacteria that may result in cavities. With the sealants, the teeth are protected from any bacteria present in the food that you eat. The effectiveness and efficiency of using dental sealants is enhanced if they are used on children before they grow adult teeth. We advise that you consider taking your child for dental sealant treatment as soon as the molar teeth begin to grow. Bacteria in your mouth eat away at the tooth surface and tend to cause the loss of minerals from teeth, making them weak. This skews the balance of minerals provided by fluoride and saliva causing tooth decay. Before teeth decay, dental caries occur on the teeth surface due to the accumulation of plaque. Pit and fissure sealants, therefore, are recommended to help prevent caries. The sealant treatment should be done before your teeth decay causing long-term dental issues like cavities. Dental cavitation is a condition that occurs when holes form on your teeth due to rapid bacterial work. These are not commonly used on our patients unless requested because of the safety concerns surrounding them. However, we highly prefer them because of their effectiveness in dental protection. These are also abbreviated as GIC and have a lower level of efficacy compared to the resin-based sealants, but they have attracted the attention of many. This is because they release fluorides that are nutritious to your teeth and are less sensitive to moisture. They are thus an excellent preventive measure for occlusal caries as they continue to produce fluoride even after the sealants have fallen out. What Could Help Enhance the Effectiveness of Dental Sealants? When you visit an orthodontist for pit and fissure sealants, you want to receive high quality services with guaranteed results. Downtown Dental will give you excellent dental sealant services using the most reliable and high quality types of sealants. 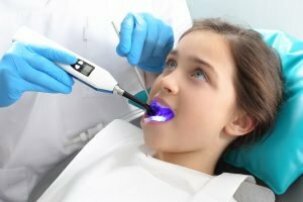 • Acquiring high standard services from our qualified dental experts with guaranteed techniques. • Isolating your teeth from saliva by avoiding too much tooth-touching with your tongue. • Having sealants placed on white teeth and not those that are a bit erupted. This is because the latter may cause gingivitis due to exposed gum tissues. • Before you can have dental sealants placed on your teeth, it is crucial that you have the plaque and other accumulated debris cleaned out. The ability of dental sealants to last long while in place varies depending on the type of sealant used and the quality of services received. You should know that sealants will wear out naturally from your teeth because of the force exerted while chewing, especially when it comes to hard foods. Regardless of this fact, Downtown Dental will ensure that the dental sealants placed on your teeth remain effective for at least 5 years and more. If you desire to go an extra mile with your dental work, contact Downtown Dental or visit our offices to book an appointment today. We will give you the smile that you've always desired!